Laser hair removal permanently eliminates unwanted hair from your body and can include removing hair from the face, arms, underarms, bikini area and chest, legs and back. Laser hair reduction is available for all skin types, including very light and very dark skin, and most hair colors. Schedule and appoint to determine if you are a good candidate for the procedure based on a variety of factors. Highly concentrated light energy from the laser is used to target and destroy hair follicles responsible for hair growth without harming surrounding tissue. The pigment in these follicles absorbs the light which destroys the hair. This results in permanent hair reduction that’s fast, easy and FDA-cleared. During treatment, most people feel only a slight pinch at the treated area. Immediately following the treatment most people experience a mild, sunburn-like sensation, possibly accompanied by some minor swelling, which can last two to 24 hours. 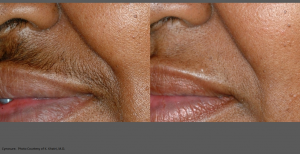 As laser hair removal can only affect hair in active phases of growth, several treatment sessions are recommended for the most successful results. Our laser selectively target dark, coarse hairs while leaving the skin undamaged. Fast treatment. Each pulse of the laser takes a fraction of a second and can treat many hairs at the same time. Permanent and lasting results. Most patients have permanent hair loss after an average of three to seven sessions. 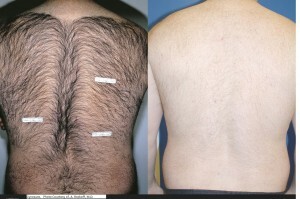 Laser hair removal is more than just ”zapping” unwanted hair. It is a medical procedure that requires training to perform and carries potential risks. Contact our office for more information or discuss with Alyson while in the office.